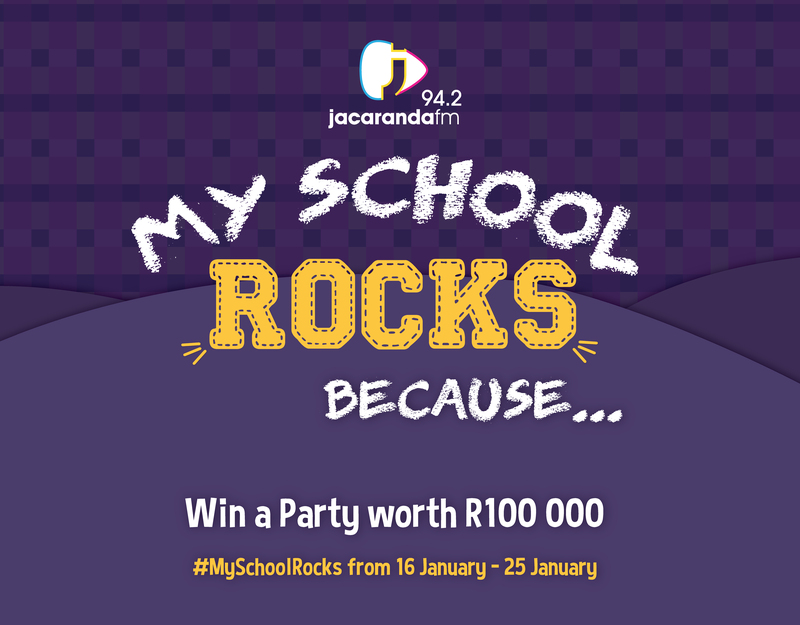 Show us why your school rocks and stand a chance to win massive prizes for your school! Different schools rock for different reasons and Breakfast with Martin Bester wants to know what makes your school extra special. Your school can rock because it has the best gees, fastest sprinters, an award-winning choir, the best hockey team or simply just the best war-cry. Schools, pupils or teachers can enter by mailing a video demonstrating how their school rocks to [email protected] OR post the video on social media, using the hashtag #MySchoolRocks. The winning school will win a massive party at their school worth a whopping R100 000. The school will also win a R100 000 airtime package. Entries open on Tuesday 22 January. Five schools will be chosen and go head to head against each other for the grand prize. Listeners will then have the chance to vote for their favourite school. The Breakfast with Martin Bester team will broadcast live from each of the five schools.